Product prices and availability are accurate as of 2019-04-11 19:14:05 EDT and are subject to change. Any price and availability information displayed on http://www.amazon.com/ at the time of purchase will apply to the purchase of this product. 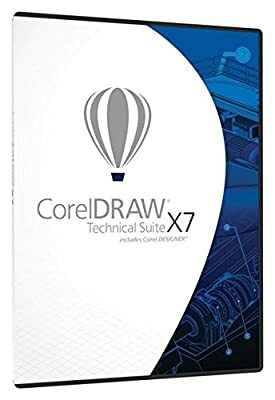 CorelDRAW Technical Suite X7 provides a complete solution for technical communication professionals, featuring dedicated illustration tools, leading file compatibility, and publishing capabilities for print, online and mobile. Create projects quickly by accessing and repurposing technical designs assets from various locations, including 3D designs and the optional add-on for 3D CAD assembly formats. Exchange files with colleagues and clients with export capabilities to a broad range of over 100 file formats, including WebCGM, .SVG, .DWG, .PDF, .EPS and TIFF. Publish documents as a 3D PDF for instant sharing, and distribute technical designs and documentation with a diverse set of cross-media publishing capabilities. Complete solution for visual technical communication Dedicated technical authoring tools Access broad range of technical assets Export to a broad range of over 100 file formats, including WebCGM, .SVG, .DWG, .PDF, .EPS and TIFF, to easily exchange files with colleagues and clients worldwide. Share your technical designs and documentation with a diverse set of cross-media publishing and distribution capabilities.